Woopidoo over at Art News Blog (CLICK) has been keeping tabs on the insane Geostationary Banana Over Texas "art" project (title link). The team's notion is to fly a colossal banana-shaped helium balloon above Texas for one month at a cost of $1.5m. All they need is the money. As if there aren't better things to waste a fortune on than scaring the livestock! "A fool and his money are soon parted", says the old Brit. proverb. In case a rich fool doesn't turn up to fund this lunacy, here's my view of it. 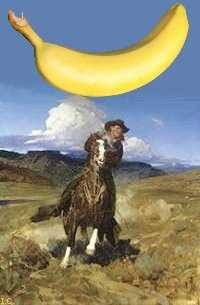 I've taken the liberty of adding a banana to Smoke of the .45 (1937) a dramatic painting by that great western artist Frank Tenney Johnson (1874-1939). Lol Ian. You might be able to help them with some fundraising posters. $1.5 million is a lot of money to raise to put a banana in the sky. It could get shot down over Texas too.. with all them gunslingers getting around on horseback. A redskin with a fire arrow couldn't wish for a more inspiring target. I doubt whether Ffifes (Britain's main banana importer) would care to shell out $1.5m on this project, despite the potential publicity. And I suspect there's duplication of effort here too. The UK has a firm that specializes in custom-made balloons for races and advertising. I saw one of these races years ago, and there were houses and all sorts of weird shapes floating in the sky.